Ugadi is just around the corner and if you couldn't go shopping yet, worry not. Here is a list of stores in Hyderabad that you should hit up to pick some Indian wear. Smacked inside Next Galleria Mall in Punjagutta, Ethnicity specialises in ethnic wear for not just women and men but also kids. They've got cotton kurtas, indigo peplum tops, and breezy cotton skirts. The price range begins at INR 799 and can go as high as INR 2,500. Check out the palazzo pants and dupatta section if you love yourself a full ensemble. Complete your look with handmade earrings, bracelets, and neckpieces. 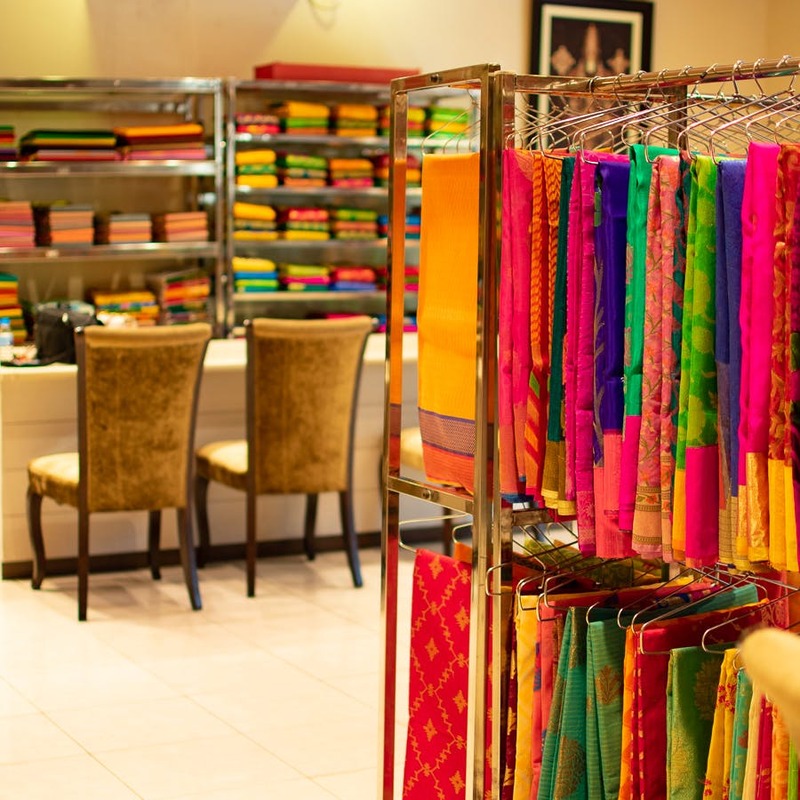 Kanchee Silks is an iconic 44-year-old store located on Banjara Hills Road No. 10. You wouldn't want to stop wearing the six-yard Kanchipattu sarees from this store, which sells sarees at wholesale prices. What will catch your eye instantly, as you step into the store, is an array of handloom sarees. Done up in colour combinations like pink and green or violet and orange, surely these are a refreshing change from the run-of-the-mill colours. Cottons Jaipur is an ideal place to shop for festive collection in radiant colours like orange, deep green, red with eye-catching patterns and minimal stone-work. It includes off-white silk kurtis with golden undertones that we loved! Shelves and hangers with kurtis in various designs like double layers, elbow sleeves, no sleeves, long anarkali fashion will entice you to keep visiting this store time and again. Deepali Tholia is a designer wear store in Hyderguda that specialises in ready-to-wear sarees, kurtas, dhotis, drape tunics, gowns and jackets that come in pastel and vibrant hues. We're loving the dhoti kurtis made from crepe that we can totally picture ourselves wearing to casual hangouts with the girl gang. Planning to stock up on cotton kurtas? Check out Anokhi in Banjara Hills, which is a Jaipur-based label that specialises in block printing work on cotton textiles. They have Indo-western wear (maxi dresses, kurtas, skirts, tops, and more) along with lovely printed scarves. The colours are neither too loud nor too sombre and make a perfect fit for your pastel persona. Eagle Block Printing & Tailoring (aka Iksha Designs) is where you should head to for custom designs on dupattas and dresses. This Sainikpuri boutique also has a fine range of palazzo pants, gowns, sarees, kurtas, and dupattas. Their catalogue offers lovely designs and colours to choose from, and they have over 3,000 blocks so it's rare to not find something to admire. Taruni might have been your constant while growing up, and we still go here to pick anarkali kurtas or blingy lehengas. We love their range of half sarees that we usually find in their General Bazaar stores. If you have a tailor who stitches up a dress in hours, the dress materials at Taruni are quite beautiful too. Run by Mrinalini Shastry, 6 Yards Plus is a saree adda in Kamalapuri Colony in Banjara Hills. This home studio is packed to the rafters with sarees, readymade blouses, and fabric. If you're planning to pick a saree this Ugadi, go here and check out some Gollabhama sarees or Goan Kunbi sarees. There are plenty of readymade blouses that you can mix and match with your sarees.